Shocked not because of the 12-letter word in the title, and shocked not because of the related four-letter word that seems to turn up in just about every line of the script. No, it’s because Guirgis, whose best-known earlier works tend to be harsh and grueling, has created a play that leaves its audiences in stitches a good bit of the time. Credit that to a playwright who has found a way to bring together the real pain of a group of troubled characters – alcoholics, drug users and the like – with an almost sweet good nature and a hilarity-producing sense that anything goes. Credit it to a director, Tony-Award winner Anna D. Shapiro (August: Osage County), who knows how to make opposites attract. And credit also the actor Bobby Cannavale, who fills the central character of the hapless ex-con Jackie with so much wound-up energy that you fear any minute he may go up in flames. Jackie is only one of a handful of characters in this dark comedy who are almost always fraught – bursting with so much fury, or confusion, or indignation, or joy that they are yelling nearly all of the time. One of them is his longtime girlfriend Veronica (Elizabeth Rodriguez), who is still using coke behind his back; one is his cousin Julio (Yul Vázquez), an effete young man who is hilariously trying to prove his toughness. And one is Victoria (Annabella Sciorra), the wife of Jackie’s AA sponsor, who has had it with her husband and thinks Jackie might be more her style. The only cool character in the crowd is Ralph D. (Chris Rock, in his Broadway debut), whose laissez-faire attitude toward life causes complications for everyone in his path. Unfortunately, Rock isn’t the actor that his castmates are, and his low-key Ralph D., while funny, doesn’t resonate in the same way as anyone else onstage. There are times when you’re not sure which way is up in this convoluted plot, and there are times when you wonder if any of it really matters. Yet there’s something sensible in the best of these characters: They’re trying to do the right thing, even if it eludes them nearly all of the time. And Guirgis’s language – at once elaborate and gritty – is priceless. “Being in love with Veronica,” Jackie says, “is like feeding your balls to Godzilla every morning,” and then he tells you exactly why that is. Cannavale’s Jackie is like a walking wound, and yet Guirgis finds a bit of peace for him – a kind of peace that may surprise audiences who expect violence to erupt at any moment. It’s a provocative turn in the road for this playwright, and it’s one that grinning audiences can embrace. 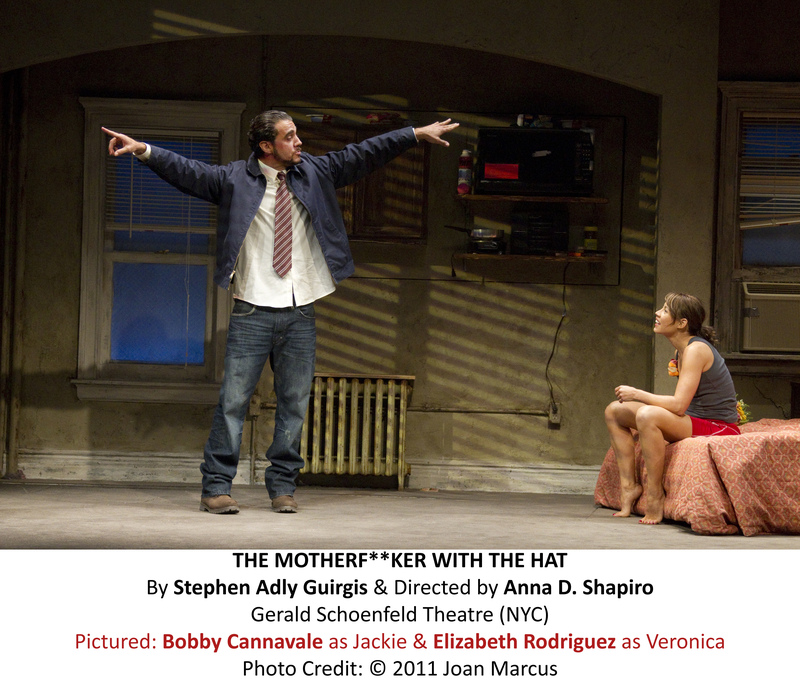 Where: Schoenfeld Theater, 236 W. 45th St., New York City. When: 7 p.m. Tuesdays, 8 p.m. Wednesdays-Saturdays, 2 p.m. Wednesdays and Saturdays, 3 p.m. Sundays, through Sept. 10 (casting after July 17 is TBA). Running time: One hour 40 minutes, with no intermission. 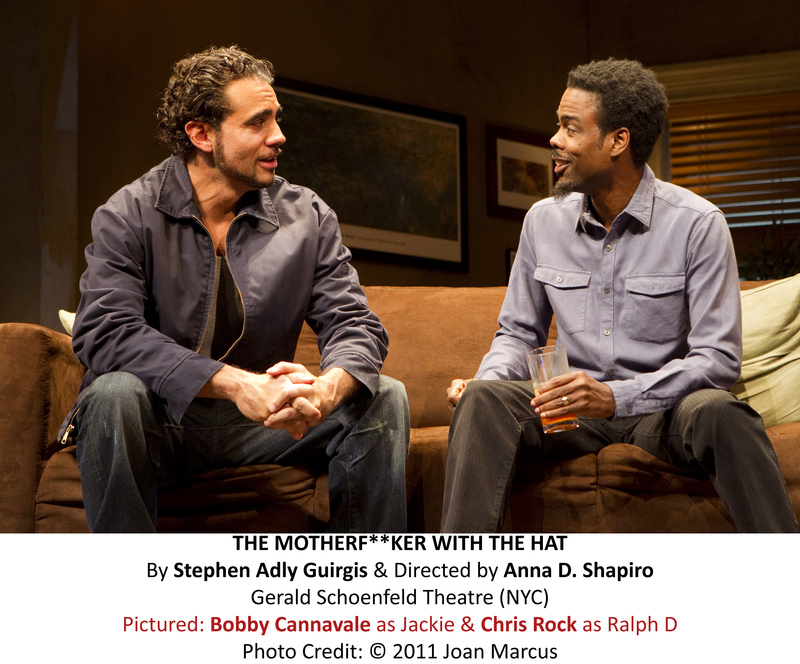 This entry was posted in Broadway, New plays, New York theater, Reviews and tagged Anna D. Shapiro, Annabella Sciorra, August Osage County, Bobby Cannavale, Broadway theatre, Chris Rock, Elizabeth Rodriguez, Stephen Adly Guirgis, The Mother With the Hat, Tony Award. Bookmark the permalink.